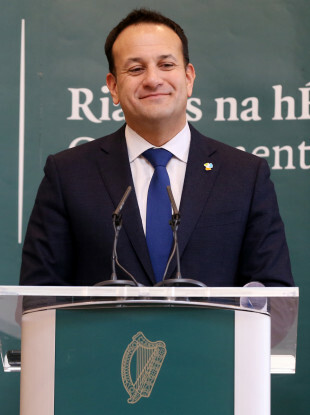 TAOISEACH LEO VARADKAR has said he is reluctant to use the term “vulture fund” when describing the firms that have bought up thousands of Irish homeowner’s mortgages. The latest Central Bank figures have revealed that 6,721 home mortgages in arrears are currently held by unregulated loan owners. The latest data – from the end-September – published by the Central Bank shows that non-bank entities – either retail credit firms or unregulated loan owners – hold 10% of all principal dwelling mortgage accounts in the country. The total balance on mortgage loans in arrears held by unregulated loan owners comes to €1.7 billion. Giving his opinion on who offers the better deals, Varadkar said that often vulture funds offer better write-downs on loans than banks. This is something that has divided financial experts, with some disagreeing or advising that such an observation does not paint the full picture. The Taoiseach also criticised Irish banks and their lack of willingness to deal with people’s mortgage issues during a roundtable interview with journalists. Many of the banks that have sold on mortgages to vulture funds are partly State owned – such as PTSB – which is 75% State owned. “Our own banks tend to ‘extend and pretend’ rather than coming to settlements with people,” he said. Finance Minister Paschal Donohoe and his junior minister Michael D’Arcy have both stated that they can not interfere in the commercial aspect of the banks they own. Speaking specifically about the recent PTSB cases, the Taoiseach admitted that the government did attempt to remove those who had reached split mortgage arrangements with the bank from the loan book sale, due to the fact they are ‘performing’ loans that are meeting their agreement. July’s Project Glas loan book, which was sold to vulture fund Lone Star for around €1.3 billion, included such customers. At the time, PTSB claimed the sale was primarily made up of people with accounts deemed “Not Cooperating” and another 3,850 who are classified as accounts which have “refused treatments or where the account has failed to operate in line with the agreed treatment”. However, it later emerged that a number of people who struck deals with PTSB, who had agreed to split mortgage arrangements with the bank and who had engaged, found their loans sold to the vulture fund. The bank later admitted that in addition to the “Not Cooperating” group and the “refused treatments” group, there was an additional two categories, which the bank omitted to include in the original sale announcement. This included properties linked to loans which “are performing/operating in line with an agreed restructuring plan”. In other words, performing and operating loans are included in the sale. This week, Varadkar said the government failed to remove these ‘performing’ mortgage-holders from the sale. We wanted those that were split mortgages to be categorised as performing but we just didn’t win that argument, so unfortunately they were counted as non-performing loans. “In terms of the selling off of the loans, that was essentially a regulatory requirement and PTSB had a lot of those on their books. “If they had not done that the banks would have found itself in a difficult position and potentially we would have had to put more money into the bank, which is something we would never do again and we managed to avoid that. The finance minister also said last week the decision to sell off thousands of mortgages held by the bank was made as the European Central Bank has demanded that banks reduce the level on what it calls ‘non-performing’ loan book. 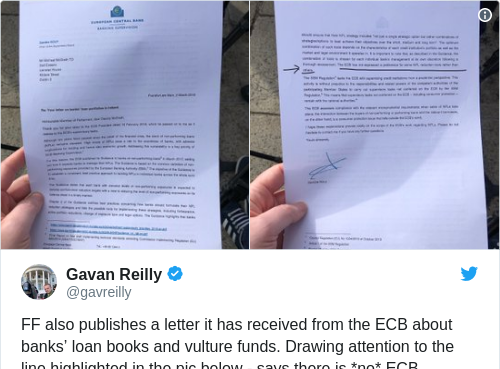 However, last March, Fianna Fáil published a letter from the ECB which states there is no directive to improve bank loan books in this way. When asked what he plans to do in 2019 to protect customers from being sold on by their bank, Varadkar said the government was supporting Fianna Fáil’s vulture fund regulation legislation. “We support that and we are going to make sure that anyone who has a mortgage, who is repaying their mortgage, making a reasonable effort to pay it, continues to have the exact same protections, the exact same consumer protections as they would if the loan was still owned by the banks. Email “Varadkar says he's reluctant to use the term 'vulture fund' to describe firms that have bought up Irish mortgages”. Feedback on “Varadkar says he's reluctant to use the term 'vulture fund' to describe firms that have bought up Irish mortgages”.